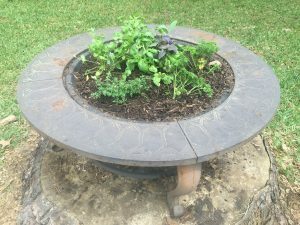 An old fire pit makes a darling little herb garden. A few weeks ago I built a new fire pit with some concrete blocks and mortar to replace an old metal pit. I always try to see if an object has functionality and could be repurposed instead of throwing it away. It turns out that the old fire pit wanted to be a kitchen herb garden. After drilling holes in the bottom for drainage, I filled the basin with soil and added plants. Now we have an herb garden and the old metal fire pit has a new purpose. 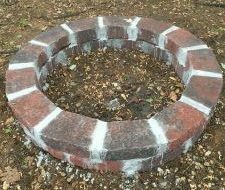 Below you can see the fire ring I built using concrete masonry blocks and premixed mortar. Pro tip: Don’t forget to level your ground. You can run strings and use levels to get a solid foundation. Now tell me what you have upcycled!